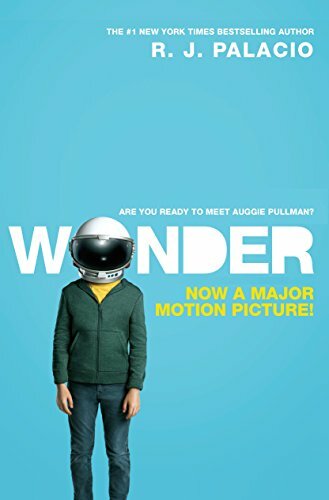 Wonder was written by R. J. Palacio. Since it's publication in the beginning of 2012 it seemed to me like EVERYONE was reading it. Bloggers reviewed it, friends read it, it was floating around my niece and nephew's house (I'm not even sure which one read it... maybe it was both)... I feel like I saw it everywhere. I kind of got it in my head that "Ugh, EVERYONE is reading that. I'm just NOT reading it." Don't ask me what sense that makes... but that tends to be how it is with me. If a book seems HUGE I just don't want to read it with everyone else. I didn't even know what it was about. I just avoided it. Then, a couple of weeks ago I was chatting with the neighbors. Somehow we started talking books. Somehow, the conversation ended with the 5th grader saying "oh, well you HAVE to read Wonder!" and with that, she handed me her copy of the book. I almost hate to admit it... but I loved Wonder. I loved Auggie (how could anyone not???). I loved his sister Via. I loved their family as a whole. I loved Beecher Prep, and the teachers, and their classes. And the book. I can't say enough about how much I loved how R.J. Palacio told the story. The brief "chapters" could have made it really choppy, but somehow that totally worked. And, what really made the story awesome for me was when the point of view shifted to different characters. The book began in Auggie's' voice, and you got a really clear understanding of how it was to be Auggie, and how he believed people thought of him. But, just when I got a real grasp of Auggie's life... the book switched to Via's perspective, and I suddenly had a different story. The same thing happened as each character got their turn in the story. I love that in an e-mail from the middle school director there is even the line "there are almost always more than two sides to every story." So, so, true. I would hope it would help everyone to Choose Kind.